We’re ideally located close to Quilcene on the Olympic Peninsula and offer the lowest moorage on Hood Canal and in Puget Sound. You pay the length of the slip or length of the boat, whichever is greater. Our fees include unlimited water and all taxes. Note: In order to keep our moorage rates as low as possible, all new moorage agreements require a 12 month lease commitment. 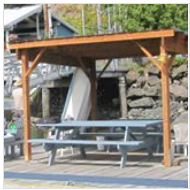 We do not offer month to month moorage. We are not currently accepting any live-aboard tenants. Limited transient moorages are available if a slip is unrented or a permanent tenant is out cruising. Call for availability and rates. Power - $5 per month connection fee plus actual usage at local PUD rates. Contact us to learn of our current slip availability. If we cannot immediately accommodate you, we encourage you to add your name to our waiting list and we will keep in touch and notify you as soon as a slip opens in the size you are looking for. There is no obligation in putting your name on our waiting list and you can either email or phone us to be included. We are always available by phone. If you are planning a visit to the marina we encourage you to call ahead and we will be happy to meet with you to give you a tour of the marina and show you which slips we have available. Please click here to contact us about your desired slip.